This image is from the Terra satellite using the Moderate Resolution Imaging Spectroradiometer. It’s supposed to show the amount of sediment in the lakes. You can go to a higher-resolution image here. 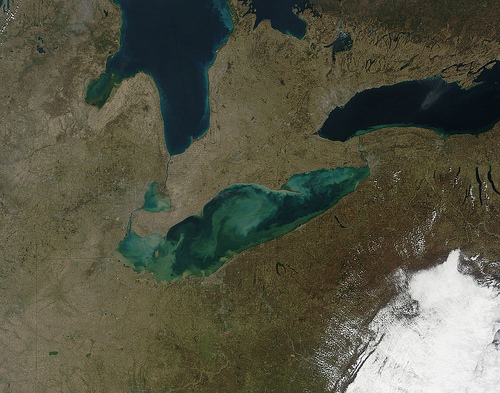 Now, Lake Erie has taken a bad rap since the early 1970s. The reason that lake, of all the Great Lakes, looks different and has been more sensitive to pollutants is because it is much shallower than the others. This makes it far more sensitive to what runs into it from the surrounding cities, towns, fields and rivers. It drains over 30,000 square miles, and Lake Ontario drains just under 25,000. The largest of the lakes, by volume, is Lake Superior; it only drains about 2/3 more area than Lake Erie. It’s also the lake with the second largest surrounding population, after Lake Michigan, which has over twice Erie’s shoreline – and it’s second by less than 0.1 percent. It has had more industrialization and more farming in its drainage area than any of the other lakes. The good thing is that it has a retention time (how long water remains in it before moving to Lake Ontario) that is half that of Lake Ontario, at 2.6 years. Lake Superior has a retention time of…191 years! So don’t look at this image and say to yourself that it shows a lake in trouble. It’s not – it shows a shallow lake with a lot of movement. It can hardly be compared chemically to the other Great Lakes at all. That gives it unique advantages and unique problems. You have to be very careful what you put into it – you can’t hope it will be diluted and forgotten. That seems to me to be a pretty mature attitude. I know at one time it wasn’t taken care of very well, but today it’s much better. What you won’t find there is that deep, clear, blue water you can find in Lake Superior or Lake Michigan. It’s just too roiled up for that. It’s most likely always going to look a little green and muddy…on the other hand, in the summer it actually gets warm enough to swim in! You are currently browsing the The Old Gray Cat blog archives for the day Monday, March 26th, 2012.